1. The paper should be set up on the drawing board using the correct technique. Then use a ruler to measure a 10mm gap near the top of the page. 2. Carefully use a T-square to draw the horizontal lines across the top of the page. The lines should be faint and drawn with a 2H sharp pencil and be 10mm apart. These are called guidelines. Check the T-square is pressed against the edge of the drawing board when drawing the lines. 3. In BLOCK CAPITALS print the title “printing exercise”. Keep the printing as precise as possible and plain - not a fancy style. 4. 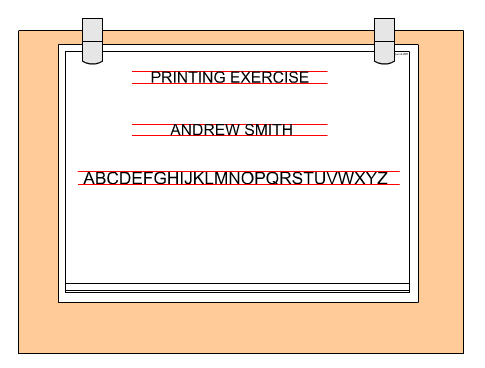 Lower down the paper, draw two more lines 10mm apart and print your full name, again in BLOCK CAPITALS. 5. Lower down the paper, draw two more lines 10mm apart and print the full alphabet.